Update: A federal judge sentenced Al-Hanooti to one year and one day in prison on March 18. A Michigan man accused of spying for Saddam Hussein's regime faces nearly four years in prison when he is sentenced on a related charge in federal court Friday. Muthanna Al-Hanooti pleaded guilty last June to one count of violating an executive order prohibiting people from doing any business with Iraq and imposing sanctions. He had a deal with senior Iraqi officials to control 2 million barrels of oil. By transferring that to a third party, Al-Hanooti stood to make $100,000, a prosecution sentencing memo said. Al-Hanooti was identified as executive director of the Council on American-Islamic Relations' (CAIR) Michigan office in 2000. But the charges against him deal with his work with a charity called Life for Relief and Development (LIFE) and its spinoff group, called Focus on American and Arab Interests and Relations (FAAIR). He worked for LIFE from 1995-2006, the sentencing memo said, noting the organization was "created after the first Gulf War in response to the economic sanctions that the United States imposed on Iraq." In addition to charitable work, the sentencing memo said, Al-Hanooti told the FBI that FAAIR was created "to lobby against the sanctions that were imposed on Iraq during the Saddam Hussein regime and to promote good relations between the U.S. and Iraq." 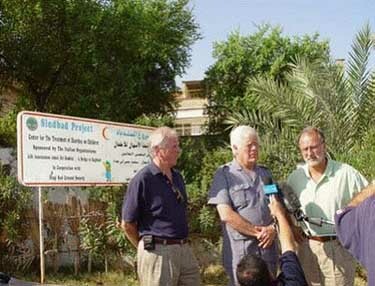 U.S. Reps. Mike Thompson (CA), Jim McDermott (WA) and David Bonior (MI) in Basra in 2002. Taken from Spring 2003 FAAIR Newsletter. According to the 2008 indictment, Iraqi intelligence officials targeted LIFE and FAAIR "to cooperate with and serve" them in trying to get rid of the sanctions. He allegedly provided them with names of sympathetic congressmen and organized a 2002 delegation to Iraq that included Democratic Reps. David Bonior of Michigan, Jim McDermott of Washington and Mike Thompson of California. While the trip was paid for by Life for Relief and Development, the money actually came from Iraqi intelligence after being routed through an intermediary, the indictment alleged. 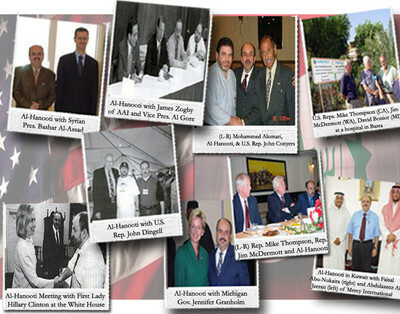 Al-Hanooti's work put him in contact with other powerful political leaders in Washington, and he was photographed with Syrian President Bashar al-Assad. The case was prosecuted by the Department of Justice's National Security Division and many court filings appear to be under seal, including Al-Hanooti's plea agreement. Al-Hanooti was born in Iraq and came to America in 1980. He was naturalized as a citizen in 1995. But prosecutors cast him as maintaining loyalty to his native land over his adopted one. As he struck the oil deal in late 2002, "war between the United States and Iraq was imminent," prosecutors wrote. Al-Hanooti "chose to ignore the national emergency that had been declared with respect to Iraq and, instead, consummate for his own benefit a significant financial transaction with the highest levels of the Saddam Hussein regime." The indictment casts the 2 million barrel oil allocation as Al-Hanooti's compensation for the effort. But the plea deal makes it unlikely that the evidence linking him to Iraqi intelligence will be released. U.S. troops raided the LIFE office in Baghdad in 2004, taking 12 computers and 20 boxes of files. Al-Hanooti told investigators that the oil was a gift from the Iraqi government in appreciation for his humanitarian work for the people there. Prosecutors dispute this claim but say accepting it would have been illegal, even if it were true. The oil allocation was approved by Iraq's then-vice president and the minister of petroleum. It was intended to help FAAIR's mission, prosecutors say Al-Hanooti admitted. He wanted to use the profits "to create print publications and a video documentary about United Nations sanctions against Iraq and the humanitarian conditions created by the sanctions, i.e., matters that were very much of concern for the Saddam Hussein regime." Prosecutors are asking that Al-Hanooti be sentenced to 46 months in prison. His lawyers are asking that he be placed on probation, saying that after the 2003 U.S. invasion, he provided "extraordinary service to the United States during the early months of its occupation of Iraq by serving as a liaison with local government and other officials and the Coalition Occupation Authority in the Baghdad area." That, the sentencing memo said, is just not true. While he claims to have made repeated trips to Iraq after the war and to have met with American military officials, Al-Hanooti remembered the name of only one official with whom he met. No one asked him to do anything, and no one from the government paid him.